Wait A Minute with Martha Fernandez-Sardina: He Has Risen. Wait A Minute with Martha Fernandez-Sardina: Here Comes Everybody. Wait A Minute with Martha Fernandez-Sardina: Easter Vigil. Wait A Minute with Martha Fernandez-Sardina: Holy Saturday. Wait A Minute with Martha Fernandez-Sardina: Divine Mercy. Wait A Minute with Martha Fernandez-Sardina: Via Crucis. Wait A Minute with Martha Fernandez-Sardina: Will & Willing. Wait A Minute with Martha Fernandez-Sardina: Satan is Selling. In part one of a two-part conversation, Bill Snyder talks with NSC Member and Founding Member of the Ark and the Dove, Tom Mangan about his conversion and the early days of the Catholic Charismatic Renewal. On this episode of Young Catholics Respond, Bill Snyder talks with Martha Fernandez-Sardina, transforming this Podcast into a LoveCast; discussing how love casts bring Christ to people, bring people to Christ, bring the outcasts into the fold and bring believers to their knees. Facebook.com/RememberYouAreLoved, Twitter.com/RememberURLoved, and RememberYouAreLoved.com; Vimeo.com/MarthaFernandezSardina and iEvangelize.wordpress.com. For a speaking engagement or consultation, contact her at 424-646- 3568, Mail@MarthaFernandezSardina.com, and Info@RememberYouAreLoved.com. On this episode of Young Catholics Respond, Bill Snyder talks with Martha Fernandez-Sardina, transforming this Podcast into a LoveCast; discussing how love casts out all fear, all doubts, all hatred and all indifference. Extreme love revealed in the Easter Triduum! Having loved His own in the world, Christ loved us to the end – washing our feet, feeding our hunger, carrying our cross, dying our death, and rising to give us His life. Are you ready, not simply to recall the events of history, but to enter the mystery? 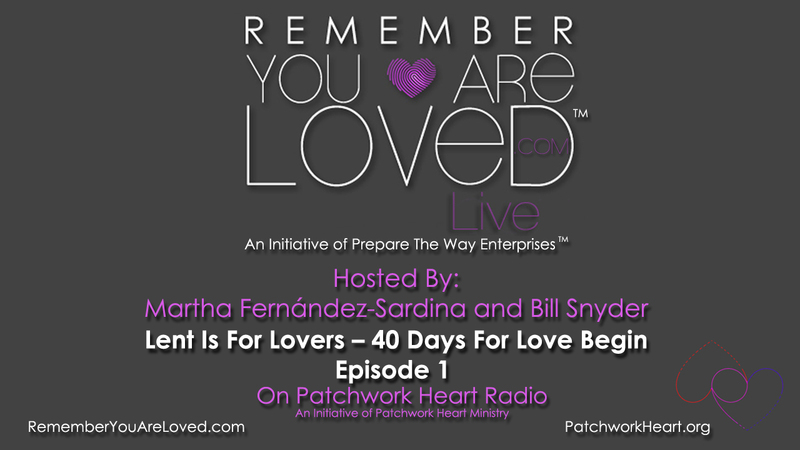 Listen as Martha Fernández-Sardina, Founder and Executive Director of Remember You Are Loved™ and Bill Snyder conclude their Lenten reflections, highlighting key moments of the Paschal Mystery celebrated during the Easter Triduum – from Holy Thursday through Easter Sunday. A purposeful observance of these High Holy Days will change your life for good! And join millions around the world in praying the Divine Mercy Novena starting on Good Friday in preparation for the Feast of Divine Mercy on the Second Sunday of Easter (April 12): http://thedivinemercy.org. Remember You Are Loved™/Eres Amado™/Você É Amado™ is a multilingual and multimedia, adaptable and easy to implement New Evangelization Outreach Project of Prepare The Way Enterprises™ that is touching hearts and changing lives around the world, by reaching and teaching people how to receive and give love, how to love more and love better every day so as to create, through this heart-to-heart love-driven and love-giving new evangelization, a culture of encounter, a culture of tender witness, a civilization of love where God's love will reign in hearts, homes, and society and serve as an antidote to the globalization of indifference and throwaway culture decried by Pope Francis, and the increasing animosity and globalization of hatred we witness among people on all sides. We can do better. On your marks, get set, ready… GO! Holy Week has arrived. Go up to Jerusalem with Jesus Christ. We are invited not simply to recall history, but to enter the mystery – the mystery of our salvation. From the entrance amidst hosannas on Palm or Passion Sunday to the Paschal Triduum itself, we are called to intensify our focus on the Person and the Message and Saving Sacrifice of Christ. This reflection might help. Listen as Martha Fernández-Sardina, Founder and Executive Director of Remember You Are Loved™, presents another Lenten reflection that is sure to help you get the most out of this Season of Lent! She discusses with Bill Snyder the purpose of the Lenten call to conversion and renewal, and how we can –and should– take full advantage of this graced time to grow. Learn why we are called to love God with our whole being and our neighbor as ourselves. Learn why and how we are called to be saints. Make this Lent about you – about your spiritual and human growth: both you and others will benefit from your conversion, and the God of the Universe will be pleased with “the new you” come Easter Sunday. Tune in regularly. Listen prayerfully. Invite others to do the same. A purposeful observance of Lent will change your life for good! 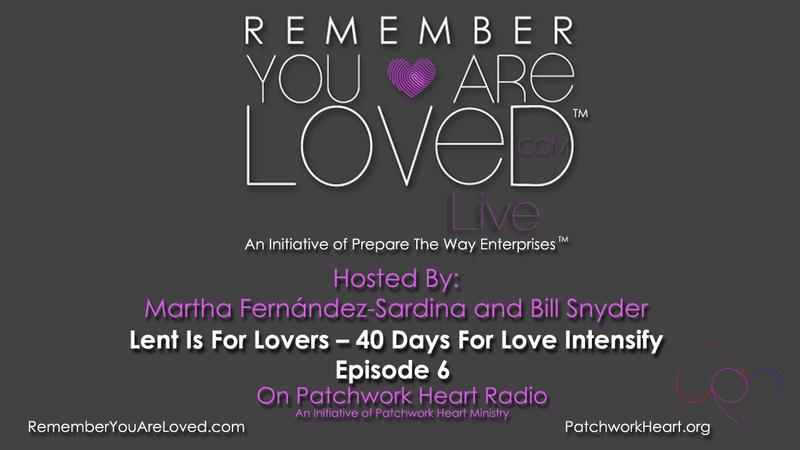 Listen as Martha Fernández-Sardina, Founder and Executive Director of Remember You Are Loved™, presents another Lenten reflection that is sure to help you get the most out of this Season of Lent! She discusses with Bill Snyder the purpose of the Lenten call to conversion and renewal, and how we can –and should– take full advantage of this graced time to grow. Learn why we are called to love God with our whole being and our neighbor as ourselves. Learn why and how we are called to be saints. Make this Lent about you – about your spiritual and human growth: both you and others will benefit from your conversion, and the God of the Universe will be pleased with the new you come Easter Sunday. Tune in regularly. Listen prayerfully. Invite others to do the same. A purposeful observance of Lent will change your life for good! Fully converted yet? What are you waiting for? We continue our Lenten journey toward the Easter Triduum so as to enter into the Paschal Mystery of Our Lord – His Passion, Death, and Resurrection, and His glorious Ascension into heaven. Conversion of the heart is at the heart of this Lenten pilgrimage. How are you doing when it comes to… Love… Commandments… Faithfulness… and Sacrifice that is pleasing to the Lord? Is there a big pay out? Huge! Jesus Christ promises a good measure, packed together, shaken down, and overflowing will be poured into your lap – if you generously respond to the demands of love. The God who is for us invites us to set things right and promises that though your sins be like scarlet, they may become white as snow; though they be crimson red, they may become white as wool. If you are willing, and obey, you shall eat the good things of the land. Who’s calling? God is calling. What does He want? He wants YOU. He invites and commands, but He graces and equips us to be and to do what we’re called to. His love beckons us to leave behind whatever impedes our growth as a disciple who is wholeheartedly in love with God and neighbor. Lent is prime time for change. Martha Fernández-Sardina, Founder and Executive Director of Remember You Are Loved™, presents a series of Lenten reflections that are sure to help you get the most out of this Season of Lent! Tune in as she discusses with Bill Snyder the purpose of the Lenten call to conversion and renewal, and how we can –and should– take full advantage of this graced time to grow. Learn why we are called to love God with our whole being and our neighbor as ourselves. Learn why we are called to be saints. Make this Lent about you – about your spiritual and human growth: both you and others will benefit from your conversion, and the God of the Universe will be pleased with the new you come Easter Sunday. Tune in regularly, listen prayerfully, and invite others to do the same. A purposeful observance of Lent will change your life for good! Remember You Are Loved™/Eres Amado™/Você É Amado™ is a multilingual and multimedia, adaptable and easy to implement New Evangelization Outreach Project of Prepare The Way Enterprises™ that is touching hearts and changing lives around the world, by reaching and teaching people how to receive and give love, how to love more and love better every day so as to create, through this "heart-to-heart" love-driven and love-giving new evangelization, a "culture of encounter", a "culture of love", a "civilization of love" where God's love will reign in hearts, homes, and society and serve as an antidote to the "globalization of indifference" and "throwaway culture" decried by Pope Francis, and the increasing animosity and "globalization of hatred" we witness among people on all sides. We can do better. What’s in it for me? A lot, in the case of Lent. Martha Fernández-Sardina, Founder and Executive Director of Remember You Are Loved™, presents a series of Lenten reflections that are sure to help you get the most out of this Season of Lent! Tune in as she discusses with Bill Snyder the purpose of the Lenten call to conversion and renewal, and how we can –and should– take full advantage of this graced time to grow. Learn why we are called to love God with our whole being and our neighbor as ourselves. Learn why we are called to be saints. Make this Lent about you – about your spiritual and human growth: both you and others will benefit from your conversion, and the God of the Universe will be pleased with the new you come Easter Sunday. Tune in weekly, listen prayerfully, and invite others to do the same. A purposeful observance of Lent will change your life for good! Copyright 2013- 2017 Patchwork Heart Ministry. All rights reserved.